Blockage of the deep venous circulation in the abdominal/pelvic area in now recognized as a major cause of Chronic Venous Disease. Chronic Vein Insufficiency (CVI) occurs when the veins cannot pump enough blood back to the heart. 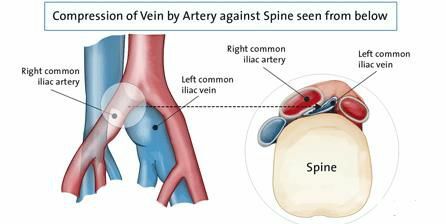 In many cases CVI MAY be caused when either the iliac vein in your pelvis becomes compressed by the overlying artery or from a blockage following deep venous thrombosis (DVT). Many patients experience the result of this iliac vein compression as leg swelling, particularly left leg swelling. See below. Intravascular ultrasound (IVUS) imaging is a minimally invasive diagnostic procedure that can be used to help diagnose Chronic Venous Disease. During this simple procedure where IVUS is used, a specially designed ultrasound catheter is guided by your vascular surgeon so that they can acquire images of compressed or obstructed vessels that allows them to develop a treatment option for re-establishing normal blood flow through these areas. Dr Kokinos, a board certified vascular and general surgeon in Silicon Valley, CA., is recognized as an expert in this rapidly expanding area of vascular surgery. She has successfully used IVUS to help diagnose and treat hundreds of patients in her Campbell, CA. outpatient facility. The procedure is done quickly and easily and a growing body of data suggests that stenting, guiding by IVUS as part of the same procedure, may effectively re-open compressed or obstructed veins with SIGNIFICANT improvement in symptoms, including pain, swelling and ulceration.